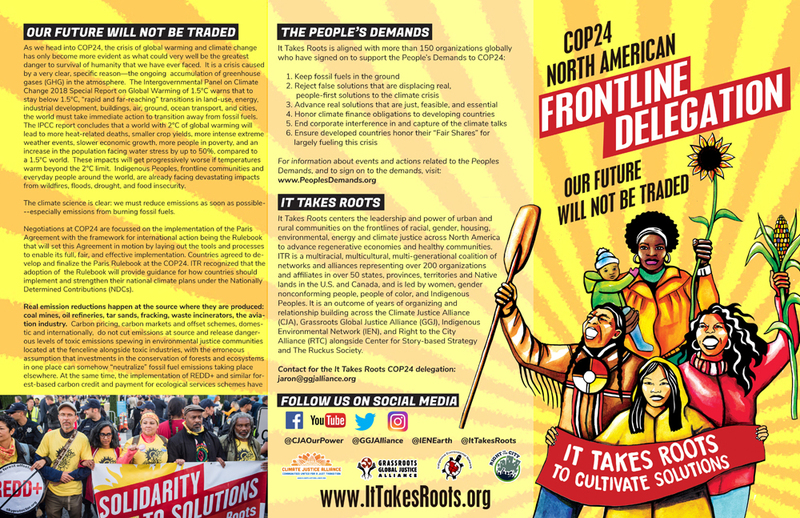 An It Takes Roots delegation of frontline leaders from North America mobilized to COP24 in Poland to bring the voices of community driven solutions to the climate crisis, and continue pressure against corporate greenwashing & carbon trading schemes. On the closing day, we joined a sit-in with our international allies. It Takes Roots threw down with the youth of SustainUS and organized an intervention during the US administration panel, which pushed for the continual use of fossil fuels and dirty energy. Aneesa Khan, 23, SustainUS youth delegation leader. Vic Barrett, 19, SustainUS Delegation, Youth plaintiff in Juliana v. U.S. 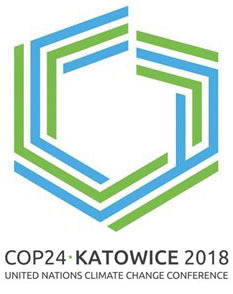 Heads of state and international leaders met in Poland from December 3-15, 2018, for COP24, the U.N. climate-change talks. 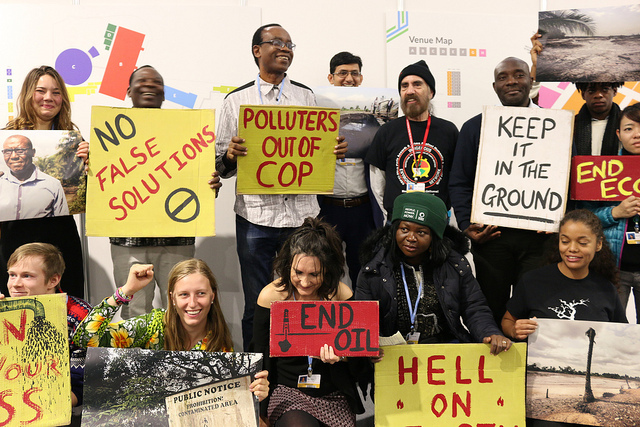 The Climate Justice Alliance was on the ground as well, together with the Indigenous Environmental Network, Grassroots Global Justice, the Just Transition Alliance and Via Campesina, as part of the It Takes Roots delegation. We are building and organizing together with our international allies, in the face of increasing racism, white nationalism and corporate control. The crisis of climate change has only become more evident as what could very well be the greatest danger to survival of humanity that we have ever faced. It is a crisis caused by a very clear, specific reason—the ongoing accumulation of greenhouse gases (GHG) in the atmosphere. The Intergovernmental Panel on Climate Change 2018 Special Report on Global Warming of 1.5°C warns that to stay below 1.5°C, “rapid and far-reaching” transitions in land-use, energy, industrial development, buildings, air, ground, ocean transport, and cities, the world must take immediate action to transition away from fossil fuels. The IPCC report concludes that a world with 2°C of global warming will lead to more heat-related deaths, smaller crop yields, more intense extreme weather events, slower economic growth, more people in poverty, and an increase in the population facing water stress by up to 50%, compared to a 1.5°C world. These impacts will get progressively worse if temperatures warm beyond the 2°C limit. Indigenous Peoples, frontline communities and everyday people around the world, are already facing devastating impacts from wildfires, floods, drought, and food insecurity. Negotiations at COP24 were focused on the implementation of the Paris Agreement with the framework for international action being the Rulebook, setting this Agreement in motion by laying out the tools and processes to enable its full, fair, and effective implementation. Countries agreed to develop and finalize the Paris Rulebook at the COP24. ITR recognized that the adoption of the Rulebook will provide guidance for how countries should implement and strengthen their national climate plans under the Nationally Determined Contributions (NDCs). Real emission reductions happen at the source where they are produced: coal mines, oil refineries, tar sands, fracking, waste incinerators, the aviation industry. Carbon pricing, carbon markets and offset schemes, domestic and internationally, do not cut emissions at source and release dangerous levels of toxic emissions spewing in environmental justice communities located at the fenceline alongside toxic industries, with the erroneous assumption that investments in the conservation of forests and ecosystems in one place can somehow “neutralize” fossil fuel emissions taking place elsewhere. At the same time, the implementation of REDD+ and similar forest-based carbon credit and payment for ecological services schemes have been documented in many instances to have failed to recognize the principles of Free and Prior Informed Consent (FPIC), and have resulted in land grabs, human rights violations and the loss of livelihood for forest-dependent communities. For all of these reasons, Article 6 of the Paris Agreement is a central focus for It Takes Roots and Indigenous and frontline communities impacted by the financialization of nature and carbon pricing and trading schemes. For Indigenous peoples, frontline communities, impacted workers, and global leaders, Just Transition will be a central focus at COP24. In hosting the COP in Katowice, Poland the UNFCCC brought global attention to the contradictions faced by coal impacted workers and surrounding communities, whose livelihoods and daily survival have been tied to the very industries that pollute the land, water and air, and are burning up the planet. COP24 illuminates the dire need for alternative economic and energy models that are in alignment with our collective survival. The It Takes Roots delegation was comprised of grassroots leaders, some of whom participated in developing the concept of a Just Transition as part of the historic work of the environmental justice movement, which drew on leadership from Tony Mazzocchi of the Oil, Chemical and Atomic Workers Union during the 1970s. The Just Transition Alliance grew out of this work, and continues to build Just Transition campaigns globally, along with a new generation of Our Power Communities within the Just Transition Alliance. Just Transition is a vision-led, unifying and place-based set of principles, processes and practices that build economic and political power to shift from an extractive economy to a regenerative economy that recognizes the rights of local ecosystems and nature to maintain their vital natural cycles of life. This means approaching production and consumption cycles holistically and waste free. The transition itself must be just and equitable– redressing past harms, ecological restoration and creating new relationships of power for the future through reparations. If the process of transition is not just, the outcome will never be. Just Transition describes both where we are going and how we get there. 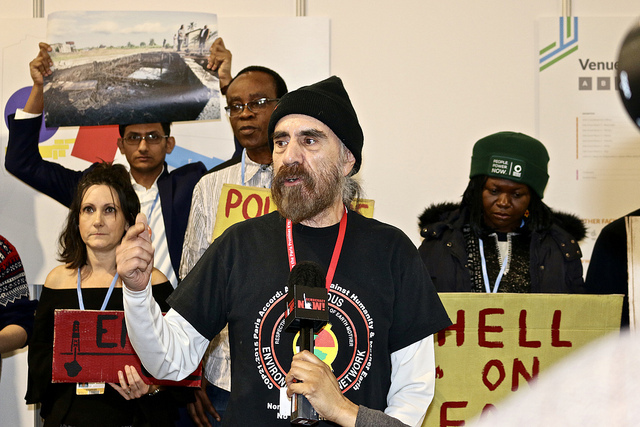 Just days after a Shell executive bragged about the corporations direct drafting of Article 6 (the market mechanisms chapter) of the Paris Agreement; international frontline community groups directly impacted by Shell’s abusive practices spoke out at the COP24 fossil-fuel trade association event. Watch a video of Alberto Saldamando of the Indigenous Environmental Network, talk about Article 6 of the Paris Climate Agreement. Watch a video of Felicia Teter, speaking on Shell and big polluter’s implication on Missing and Murdered Indigenous Women. The Indigenous Environmental Network and the Climate Justice Alliance launched the Carbon Pricing report at COP23. Carbon market systems will not mitigate climate change, will not advance adaptation strategies, will not serve the most vulnerable communities facing climate change impacts and only protect the fossil fuel industry and corporations from taking real climate action. 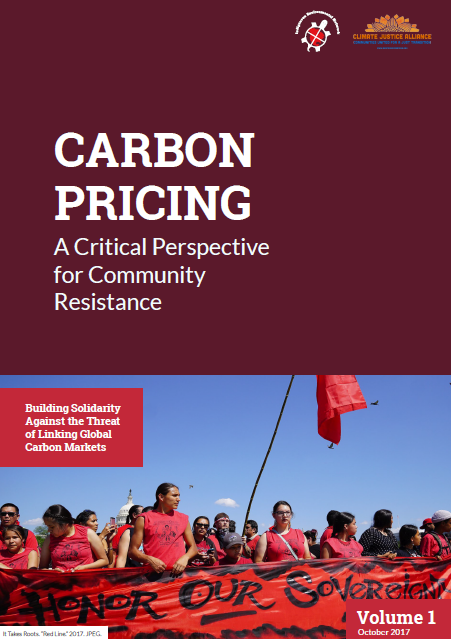 Download the report Carbon Pricing: A Critical Perspective for Community Resistance (PDF). 1. Developed countries pledge for a just and equitable transition to 100 percent Renewable Energy by 2030. 2. Governments phase out subsidies to the fossil fuel industry and pledge to divest fully from fossil fuels by 2020. 3. Pledge to an outright and immediate ban on fracking and adopt a global moratorium on new fossil fuel exploration and extraction techniques starting in 2018. 4. Agree to an international moratorium on new coal projects effective immediately. 1. Reject offsets and stop the transition of the Clean Development Mechanism into the guidelines for implementation of the Paris Agreement in the guise of the Sustainable Development Mechanism. 2. Honor the international Moratorium on geoengineering established by the Convention on Biological Diversity. 3. Reject Carbon Capture and Storage (CCS) and Bioenergy with Carbon Capture and Storage (BECCS) projects, and other technofixes. 4. Stop the conversion of local agricultural lands to non-food production purposes. 5. Reject REDD+, REDD-like projects, Internationally-Traded Mitigation Outcomes (ITMOs), and all forms of carbon trading schemes that undermine human and indigenous rights, including indigenous cultures, territorial sovereignty, and integrity. 6. Stop supporting and promoting burning biomass as renewable energy and reject the substitution of biofuels and bioenergy as an alternative to fossil fuels. 7. Reject corporate-fronted schemes promoting so-called “Climate Smart Agriculture”. 1. Transform energy systems away from corporate-controlled fossil fuels and other harmful sources such as nuclear, mega-hydro, and biofuels to a clean, safe system that empowers people and communities. 2. Support ecological restoration to recover natural sinks, and stop all projects that are extremely destructive of Earth’s natural capacity to absorb greenhouse gases. 3. Support global efforts for a just and equitable transition that enables energy democracy, creates new job opportunities, encourages distributed renewable energy, and protects workers and communities most affected by extractive economies. 4. Commit to policies that embrace agro-ecological practices and food sovereignty in place of “Climate Smart Agriculture”. 5. 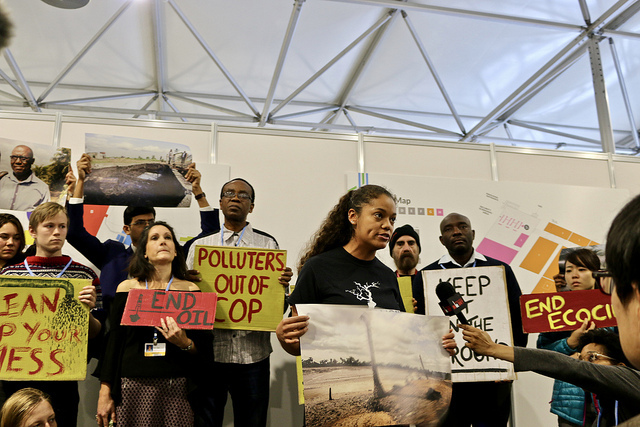 Facilitate and support non-market approaches to climate action. 6. Adopt a technology framework that recognizes the importance of endogenous and indigenous technologies and innovations in addressing climate change, and enables developing countries and communities to develop, access, and transfer environmentally sound, socially acceptable, gender responsive and equitable climate technologies. 7. Respect and enable non-corporate, community-led climate solutions that recognize the traditional knowledge, practices, wisdom, and resilience of indigenous peoples and local communities, and protect rights over their lands and territories. 8. Ensure participatory and transparent assessment of all proposed climate technologies and reject barriers to technology access and transfer such as intellectual property rights. 1. Replenish the Green Climate Fund to ratchet up climate action to stay below 1.5 degree Celsius global temperature rise, and fulfill developed countries’ commitment to provide $100 billion a year by 2020. 2. Provide adequate and real money (in addition to Overseas Development Assistance) to scale up adaptation and ensure protection to climate migrants and those impacted by climate change. 3. Developed countries must make new concrete pledges of public climate finance accompanied by a definite timeline for delivery. 4. Commit to climate reparations to those most affected but least responsible for climate change. 1. Advance a conflict of interest policy that protects Paris Agreement implementation and global climate policy from obstruction by Big Polluters, and mandates governments take action at the national level. 2. Prohibit industries that profit from fossil fuels and the climate crisis from influencing international and national climate policy forums. 3. Reject every attempt by corporations and their proxies to insert themselves into the negotiations. 4. Advance a call to hold corporations accountable for the impacts of decades of misinformation and political interference in climate policy. 1. Developed countries must publicly recognize and act on their greater historical responsibility for greenhouse gas emissions. 2. Ensure developed countries take ambitious action in accordance with their historical responsibility and capacity, with ambitious domestic targets (including the rapid phase out of fossil fuel extraction and dirty energy subsidies), international cooperation, and support for global climate finance and Just Transition in developing countries. 3. Drastically increase the ambition of domestic commitments and global targets to limit warming to 1.5 Celsius and ensure such commitments are set in accordance with science and equity. It Takes Roots is a multiracial effort led by women and gender oppressed people of color and Indigenous peoples on the frontlines of racial, housing and climate justice across the country. The collaboration began during the organizing for the Peoples Climate March in 2014 and has since continued to build a Visionary Opposition. Today It Takes Roots has alliance members in 200 organizations and in more than 50 states, provinces and Indigenous territories, nationwide and in Canada. Each alliance is led by grassroots organizations, and each brings unique contributions to our collective work. Side Event – Fork in the road: Just Transition & True Climate Action or Dangerous Distractions and Climate Chaos? A panel presentation with representatives from IEN (Tom BK Goldtooth), Climate Justice Alliance, Grassroots Global Justice Alliance, La Via Campesina, the Just Transition Alliance; Friends of the Earth International, Transnational Institute. This workshop will deepen discussion around what Just Transition means when grounded in the leadership of Indigenous Peoples, food producers, fence-line communities, and frontline workers movements. It Takes Roots delegation members will participate in some of the Just Transition events happening thought out the day. Just Transition needs to promote rapid decarbonization, challenge social inequalities and overcome a green growth agenda. We need to question the predominant idea of work, power relations and consider intersectional issues (gender, human rights) and the participation of indigenous/local communities. Speakers: Avril de Torres, Philippines, Patricia Bohland from GenderCC; Dunja Krause, UNRISD; Jaron Browne, National Organizer, Grassroots for Global Justice (GGJ) alliance; stepping in for Tom Goldtooth, IEN. Heinrich-Böll-Stiftung is convening this discussion on many of the critical axes of struggles within the climate justice movement, include Human Rights, the Rights of Mother Earth, Geoengineering and the HOME campaign. Speakers will include Cynthia Mellon from the Climate Justice Alliance as well as a number of our global allies. 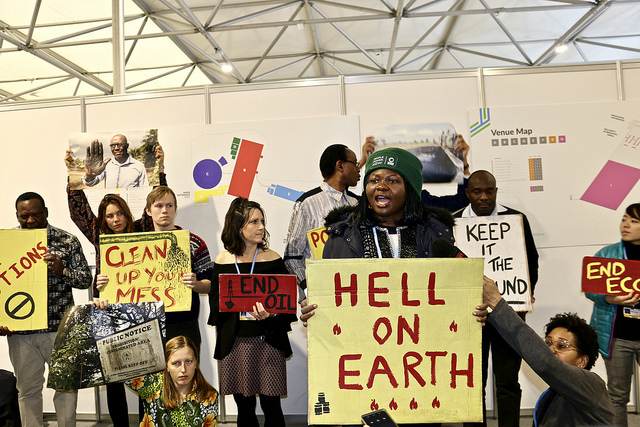 Join the Women’s Earth and Climate Action Network (WECAN) International at the UNFCCC COP24 climate talks! During this December 12th COP24 side event, ‘Women for Climate Justice Leading Solutions on the Frontlines of Climate Change’ – grassroots and Indigenous women leaders, alongside representatives from international organizations, will speak out to address the need for solutions based in a climate justice framework, including forest and biodiversity protection, Indigenous rights advocacy, agro-ecology implementation, fossil fuel resistance, and protection of women land defenders. FEATURING – Carmen Capriles (Feminist, Human Rights and Environment Defender, Bolivia); Ruth Nyambura (Feminist, Organizer and Researcher, Kenya); India Logan-Riley (Ngati Kahungunu ki Heretaunga, Youth climate leader, Aotearoa/New Zealand); Aneesa Khan (COP24 Delegation Leader with SustainUS, U.S.); Elaine Colligan (Organizer and Activist, Masters in Philosophy in Political Theory at Oxford, and Women’s Earth and Climate Action Network Programs Contributor, U.S.); and others.